It was one helluva sandwich. I’d joined the Istanbul locals as they queued by the Galacta Bridge where a fisherman in a bobbing boat with nothing more than a primus-stove, a frying pan, a heap of freshly caught fish, crusty bread, and big, yellow, lemons, provided the best takeaway I’ve ever had. The fried fish slapped between two pieces of bread was a gourmet sandwich worthy of at least one Michelin star. Istanbul is a great place for snacking and the food is fresh, tasty and clean. Apart from the open charcoal grills where succulent marinated meats are singed before your eyes, there are shops selling simple dairy dishes like herb yoghurt with sweet garlic and a very tasty rice pudding. Over 1000 bakeries in the city sell freshly made backlavas, almond cakes and melt in the mouth pastries (it was the Turks who introduced the Austrians to strudl pastry as they hammered on the gates of Vienna in the 17th century). The Istanbul skyline is best from a boat on the Bosphorus. The sight is breathtaking whether you make the trip on one of the passenger ferries that zigzag up and across the river every few minutes between the Asian and the European side. or take the twenty minute crossing to Üsküdar on the opposite bank, a perfect place to stop for a drink in one of the quiet tea rooms that are a feature of the area and from which you can take in the views. By the Galacta Bridge is the Spice Market, its air fragrant with the aromas of cinnamon, caraway, mint, thyme and saffron. Through its narrow streets lined with shops and stalls selling spices, nuts, fruits and vegetables the hot-tea sellers ply their trade, small glasses of the amber liquid swinging from copper trays hung from their shoulders. The spice market is easier to negotiate than the more colourful. five-centuries-old Kapali Çarsi, the Grand Bazaar, but even here you are seduced by smells. Against all odds, by the entrance to the Grand Bazaar sweet thyme grows between the cobblestones releasing its perfume everytime it is stepped on. Inside this, the world’s biggest covered market, are seventy streets linked by narrow lanes in which there are more than four thousand shops. Each trade has its own street so you will find all the goldsmiths in one street, the carpet sellers in another, the ceramic-makers in yet another, brassware, leather and glass, and so on. From the markets it is but a short walk to the treasures that dot Istanbul, like those in Florence, an organic part of the capital. Istanbul is a lived-in city: old wooden houses sit next to mosques and museums and the culture and the people is part of the same fabric. An ever growing population mingles with tourists in the labyrinthine streets and stand nonchalantly on the Hippodrome which was built for third century chariot races by Septimus Severus. Across the road lies the Blue Mosque of Sultan Ahmet I (so called because of the blue Iznik tiles that grace the underside of the great dome) with its magnificent cascade of domes and six slender minarets. The supreme example of Islamic mathematical harmony however, is the biggest mosque in Istanbul, the Sulemaniye Mosque, the 16th century masterpiece of the architect Sinan built on the orders of Sultan Suleman the Magnificent. 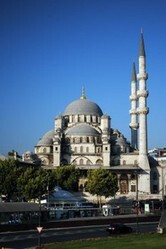 It lies to the west of the old town on a hilltop above the Bosphorus and is a famous landmark. One monument in Istanbul dominates everything else - the 6th century Aya Sofya, originally commissioned by the Roman Emperor Justinian Monolithic columns and huge galleries try to fill its vastness but merely serve to underline its emptiness and for a millenium, until 1453, it was considered to be the greatest church in Christiandom. Standing in the gardens that separate the Aya Sofya and the Blue Mosque it is difficult to realize that more than one thousand years of turbulent history separate these two buildings. Nott far away is the Topkapi Palace, home of the Ottaman sultans for more than four centuries and for four hundred years the heart of the Ottoman Empire, a once secret place of harems, concubines and eunuchs. It is a stunning treasure house of emeralds and gold thrones. Across the Golden Horn in the New City lies a modern addition to Islanbul. the Dolmabahçe Palace, built in the 19th century whose forty-three reception halls are decked out in flamboyant gilt, Bohemian crystal and Hereke carpets - an exercise in outrageous flamboyance. Constantinople was founded on trade and in the thronged markets and streets, nothing has changed. You will constantly be importuned by young men who invite you to visit their brother-in-law’s home for tea, but although you will be offered a glass of tea, the ‘home’ is a carpet warehouse and a very hard sell from skilled salesmen follows. Few escape without buying something, so be warned. In Istanbul the children may use their wiles to entice you into the shops, but outside the city, the real treasures of Turkey are the people. Courtesy and hospitality to strangers is a way of life - most notably in the countryside where there is a complex world of modernity and antiquity. At the ancient sites of Side and Antalya, Ephesus and Perge, the antiquarian may weep when he sees glorious mosaics bring trodden underfoot by cattle and goats, but there is something wonderfully liberating in the sight of these awesome monuments to a past glory being made use of by domestic animals. Eighty miles inland from Istanbul lies Pamukkale, an unforgettable natural phenomenon where hot waters have sculptured white mineral deposits into hillocks in which hot springs have formed. These have been channelled to the hotels to provide private pools and it is refreshing to step outside your bedroom and dive straight into warm water. And from Ephesus to Istanbul you’ll find courtesy and kindness. On the bus a housewife will break off a carnation from a bunch she has just bought and shyly offer it to the visitor. A farmer will produce an orange from his pocket and thank you for accepting it, and even the old man who carries his scales under his arm and offers to weigh you for a few cents (a Euro if you can spare it) will knock a few kilos off if he thinks you will be upset. It is hard to resist the food, a fusion of Far East and Mediterranean. This is real fusion cooking not the artificial blending of eastern and western styles that passes for fusion in the trendy restaurants of Europe and the USA. The cuisine of Turkey is an integral part of the culture of the nation, a part of the rituals of daily life. And if you need proof, take a good look at the kitchens of the Toptaki Palace which fed as many as ten thousand people a day. And for further proof, queue up with the locals on Galacta Bridge for one of those fish sandwiches. You won’t regret it. Yes, there is nothing quite like a Middle Eastern bazaar. Great destination. Instabul is indeed a very beautiful place and, of course, visiting a bazaar there is a must!